West Michigan has to offer. Why not consider a "Hi-Fi" Vacation? Looking for a unique vacation experience that has something for literally everyone? Look no further than West Michigan. From the miles of sandy beaches of beautiful Lake Michigan to small town charm to big city excitement, West Michigan is a vacation Mecca that is not to be missed. Here are just a few of the locations to consider when planning your Pure Michigan, "Hi-Fi" Vacation. 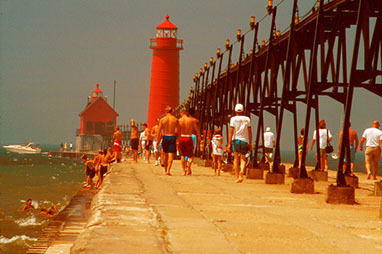 Grand Haven State Park was nationally recognized for having one of the top five beaches in the United States, by Good Morning America - Travel Mom, and as a Best Secret Beaches on Earth by Travel & Leisure. In summer, water temperatures frequently reach the low to mid 70s°F. The Grand Haven port community is an active beach resort with boating, fishing, sailing, biking, skating etc. along with connecting campgrounds and recreational areas. The city has over 100 miles (160 km) of bike trails, a state beach, boardwalk, two lighthouses, a pier, wharf, large charter fishing fleet. 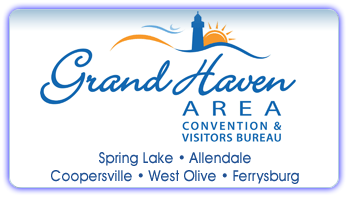 Grand Haven is a destination point for residents of inland cities of West Michigan, as well as many from the other side of the state. 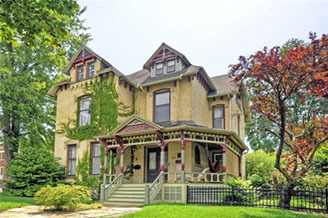 Many regularly visit to take advantage of the close proximity to the Lake Michigan beaches, State campgrounds, restaurants, bars, attractions with many even owning cottages in the area as their home away from home. West Michigan has been called the Midwest Mecca of beach volleyball due to the quality of sands. Grand Haven State Beach is one of many destinations for volleyball enthusiasts and hosts the AVP Pro Beach Volleyball Tournament throughout the summer months. In recent years, the beach has also become a destination for beach soccer, playing host to the largest of 12 annual Soccer in the Sand tournaments held throughout the country. Grand Haven is also home to a golf course. The Grand Haven Golf Club was designed in 1965 by the legendary pioneer of Michigan golf, architect Bruce Matthews Sr. It has been featured in Sports Illustrated, Golf Digest magazines and on USA Network's "PGA Tour Sunday." Grand Haven is home to the United States Coast Guard's "Group Grand Haven," which coordinates all Lake Michigan Coast Guard activities. The first Coast Guard presence in the city was in 1924. The Coast Guard cutter Escanaba was based in the city until the Second World War. After it was sunk by a U-boat of the German Navy, the citizens of Grand Haven raised more than $1,000,000 in bonds to build a replacement cutter bearing the same name; several pieces of wreckage remain displayed on the city's waterfront. 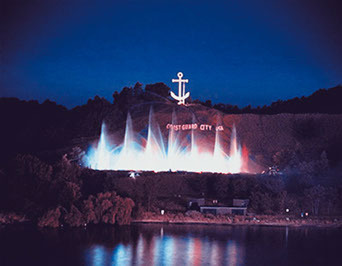 Grand Haven hosts the annual Coast Guard Festival, a celebration based on Coast Guard Day, which draws U.S. and Canadian vessels along with parades of bands and other activities, including a memorial to the 101 sailors lost in the Escanaba sinking. The yearly attendance for this event exceeds 300,000 people over the two-week period of the festival. Grand Haven is the only city officially designated as Coast Guard City, USA by an act of Congress signed, Public Law 105-383. Grand Rapids is the home of John Ball Park, Belknap Hill, and the Gerald R. Ford Museum, the final resting place of the 38th President of the United States and former First Lady Betty Ford. Significant buildings in the downtown include the DeVos Place Convention Center, Van Andel Arena, the Amway Grand Plaza Hotel, and the JW Marriott Hotel. The Urban Institute for Contemporary Arts is located downtown, and houses art exhibits, a movie theater, and the urban clay studio. 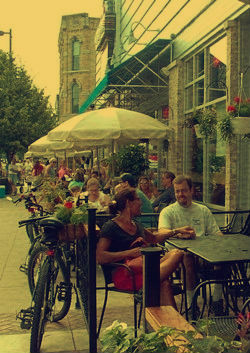 Heritage Hill, a neighborhood directly east of downtown, is one of the largest urban historic districts in the country. It was the first "neighborhood" of Grand Rapids and its 1,300 homes date from 1848 and represent over 60 architectural styles. Of particular significance is the Meyer May House, a Prairie-style home designed by Frank Lloyd Wright in 1908. It was commissioned by local merchant Meyer May, who operated a men's clothing store (May's of Michigan). The house is now owned and operated by Steelcase Corporation. Steelcase manufactured furniture for the Johnson Wax Building in Racine, Wisconsin, which was designed by Wright. Because of those ties, Steelcase purchased and restored the property in the 1980s. The restoration has been heralded as one of the most accurate and complete of any Wright restoration. The home is used by Steelcase for special events and open to the public for tours. Grand Rapids is home to myriad theatres and stages, including the newly reconstructed Civic Theatre (also known as the Meijer Majestic), the city's largest theatre, DeVos Hall, and the convertible Van Andel Arena. Further east of downtown is the historic Wealthy Theatre. In Grand Rapids Township, the Frederik Meijer Gardens and Sculpture Park combine 125 acres (1 km2) of world-class botanical gardens and artwork from such sculptors as Mark di Suvero, Alexander Calder, Edgar Degas, and Auguste Rodin. The Gardens' amphitheater plays host to numerous concerts each summer, featuring such acts as Jonny Lang, The Pointer Sisters, Lyle Lovett, Cowboy Junkies, and B.B. King. The Gardens were mentioned in Patricia Schultz's book 1,000 Places to See Before You Die. Grand Rapids was voted best beer city in the US by the national Beer Examiner blog in 2012 and 2013, and its beer-tourism revolution rages on. 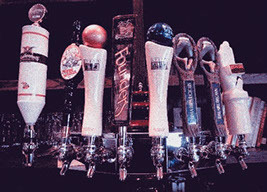 Over 25 craft breweries pour in the area, and events like Cool Brews Hot Eats and the Winter Beer Festival (both in February), and the Summer Craft Beer Festival (August), keep the city festive year-round. 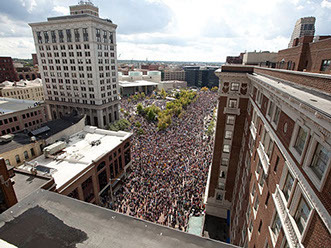 Grand Rapids also hosts the world's richest and most radical art competition. ArtPrize (www.artprize.org) lets more than 1700 painters, sculptors, designers, and performing artists from 45 countries display their pieces around the city for all to see. Artworks pop up everywhere - in banks, parks, bookshops, and yes, breweries. The public then votes on who wins the $350,000 in prize money - including the $200,000 top award, a whopping amount for this sort of contest. A Michigan quilter who stitched a helluva rendering of nearby Sleeping Bear Dunes won the 2013 prize. The mind-expanding fun takes place from late September through early October. 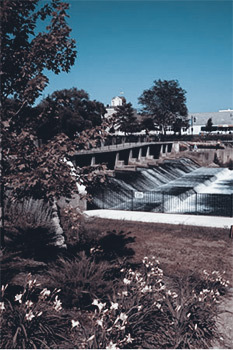 The City of Rockford, Michigan, located on the banks of the Rogue River in Northern Kent County, is a mere 10 miles from the City of Grand Rapids. 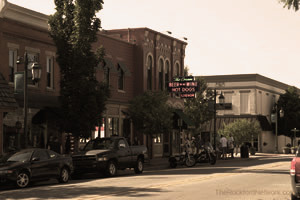 While providing its residents, patrons, and local merchants the amenities of a larger metropolitan area, the City of Rockford has been able to retain its small town charm and ambiance. With quaint shopping boutiques and wonderful outdoor activities, the City of Rockford is truly a gem in the West Michigan area. Founded in 1844 by Smith Lapham and originally called Laphamville, the City of Rockford was incorporated as a village in June of 1866. From its small beginnings, Rockford has grown to be a diverse self-sustaining community of nearly 5,000 residents. 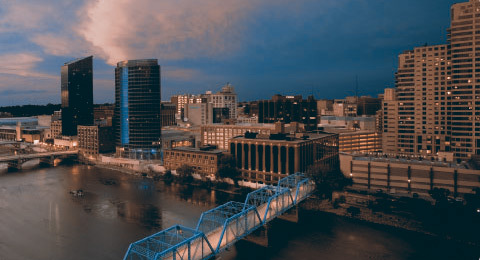 With a bustling shopping district and a strong industrial base, the City of Rockford is primed to continue to develop its long standing legacy as a premiere destination in West Michigan. With abundant recreational activities, numerous golf courses, wonderful lakes and rivers, and its close proximity to the Rogue River and White Pine Trail, the City of Rockford is a family oriented destination that is "Good for Strolling...Great for Shopping."